Creativity is not just having an artistic talent or the act of inventing something new; it is a way of approaching life. 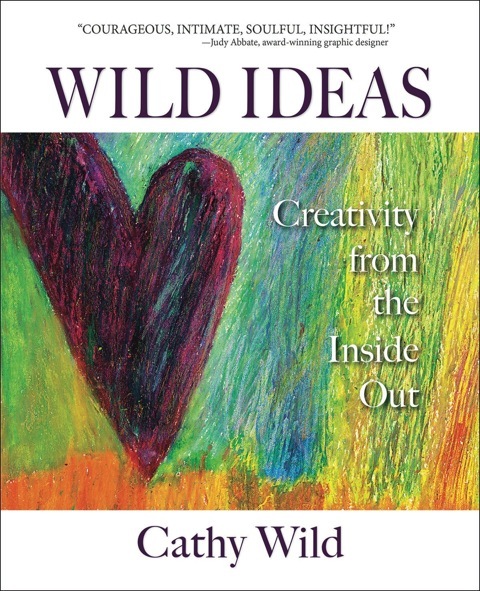 In her book, “Wild Ideas: Creativity from the Inside Out,” Cathy Wild explains how we all begin our lives with an ability to exist as creative beings. Unfortunately as we age, we erect defenses to protect ourselves that can stifle this creativity. And, in doing so, we dismiss or relinquish many forms of expression that could grant us a richer existence. Ms. Wild reacquaints us with the creative process by presenting it in seven stages. Within each stage, she details five “inner” qualities or steps that are integral to moving forward. The author encourages the reader to use the book as a resource and seek out the information that speaks to them. Throughout the individual chapters, Ms. Wild gives examples of her own experiences and those of her clients to illustrate many of the blockages that can obstruct creativity. The author’s personal story is literally what led her to create this book. At a young age, Ms. Wild was neglected by a mother who had succumbed to substance abuse and depression. Growing up, the author learned to escape her reality and find comfort in her imagination by reading books and exploring nature. Although never labeled as a creative person or artist in school, she still found little interest in performing routine jobs. When she discovered that her true passion lay in the field of health and healing, she began a career as a personal development consultant. Looking back, she realizes that it was the creative process that helped her to express her purpose so that she could transform, gain clarity and heal. There were so many aha moments for me in this handbook. But the one that sticks with me the most is Ms. Wild’s statement, “Creativity thrives in the space between our efforts.” I feel drawn to this concept and realize that it is the same way that I perceive the act of meditation. In quieting the mind, you generate room for new ideas to come forth. I also appreciate the way that Wild steers the reader’s mind through the process of creativity as though she were speaking directly to you. Her writing is fluid and easy without being elementary. I think captivating would be my word for describing her narration since one section so effortlessly entices you onto the next. By organizing the book into chapters and sections, Wild allows the reader to pinpoint and diagnose individual aspects of creativity that may be occluded or need more attention. I find the questions at the end of each section akin to a “self-help quiz.” They are insightful inquiries that would make great motivation for journaling. In general, I view most self-help books to be a chore to read and, in the end, not always targeted to my specific needs, leaving me a bit dissatisfied. But, in my opinion, “Wild Ideas” is a rarity - a well-written, comprehensive, stimulating and useful guide. Cathy Wild takes an esoteric concept, creativity, and transforms it into a science by breaking it down into its separate components. Whether you are stuck in a temporary rut or looking to fulfill a lifelong dream, “Wild Ideas: Creativity from the Inside Out” can help you rediscover yourself so that you can get back on track. This book is a fantastic journey into self-reflection and one that I will be revisiting again and again.